Railpictures.ca - John Pittman Photo: CP 8523 (AC4400) and CP 8758 (ES44ac) lead the second Hamilton Sub southbound of the afternoon out of the autumn woods. They are approaching the underpasses below Plains Road and Ontario Highway 6. The train crossed into Burlington just south of Waterdown, continuing the curving descent of the Niagara escarpment. | Railpictures.ca – Canadian Railway Photography – photographie ferroviaire Canadienne. 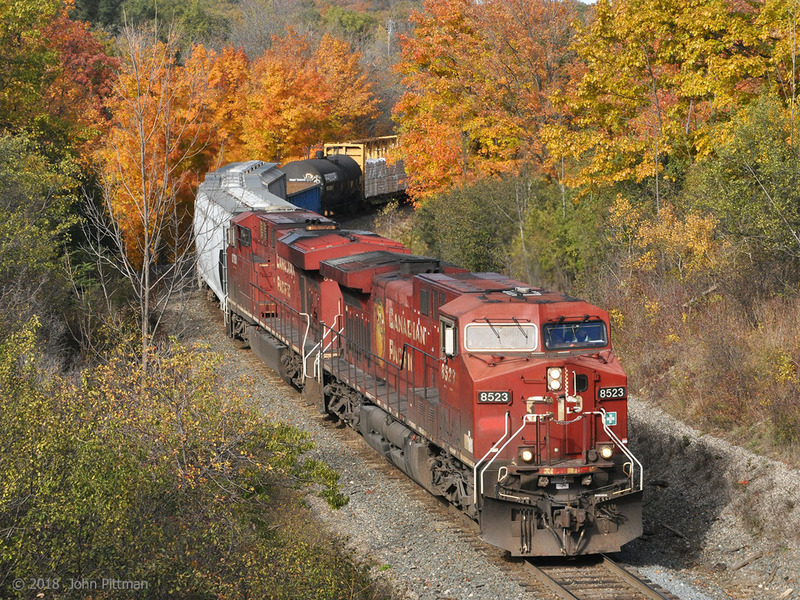 Caption: CP 8523 (AC4400) and CP 8758 (ES44ac) lead the second Hamilton Sub southbound of the afternoon out of the autumn woods. They are approaching the underpasses below Plains Road and Ontario Highway 6. The train crossed into Burlington just south of Waterdown, continuing the curving descent of the Niagara escarpment. And don’t try parking with 4 ways on in the bike lane. Not only do you get scowls from bikies, the cops (Halton) love to patrol for speeders there (they sit in the parking lot watching southbound cars) and will spot you and come right over. Taken a few steps north of Plains Road bridge over CP (north end of Plains near York). Nice afternoon background but grungey close-up, main downside of the spot is parking – I walked 1/2 km north on Plains Rd from commuter lot. Bike lanes and guardrails make parking near bridge risky, but just south of the guardrails could work (or York Rd). Thanks for your comments Dave, and congrats on your classic images. Never taken a picture here. I will have to keep that spot in mind. The York Rd location is a bit tighter. Nice fall colours. That looks like the York Rd. bridge. Nice spot looking north.